The US Federal Reserve has raised its key interest rate by 0.25 per cent for a third time in 2018 bringing it to the two to 2.25 per cent range. 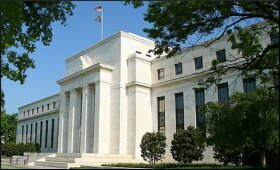 In a statement on Wednesday, following its two-day meeting in Washington, the Federal Open Market Committee also dropped its earlier "accommodative" stance on monetary policy. The majority of Fed members also said they expect another hike in rates before the end of 2018. The nine-member committee voted unanimously for the hike. In continuing with its policy of gradual rate rises, the latest one marks the Fed's eighth rate hike since 2015, indicating its favourable assessment of the US economy. The Fed statement said that growth and employment gains in the domestic economy have been strong and inflation has remained near the US central bank's target of two per cent. "The committee expects that further gradual increases in the target range for the federal funds rate will be consistent with sustained expansion of economic activity, strong labour market conditions and inflation near the committee's symmetric two per cent objective," the statement said. America's GDP in the second quarter of 2018 grew at over four per cent, while the unemployment rate continued to stay below four per cent. According to Fed projections released after the meeting, the US economy was expected grow by 3.1 per cent in 2018. Noting the rising concerns from businesses about the risk from new US trade tariffs, US Fed Chairman Jerome Powell, however, also warned that a permanent shift to a "more protectionist world" would hurt US and global economies. Key Indian equity market indices on Thursday opened higher despite a muted trend in Asian markets and rate hike by the US Fed. The Sensitive Index (Sensex) of the BSE, which had closed at 36,542.27 points on Wednesday, opened higher at 36,691.93 points. Fears over a rise in US interest rates along with profit booking ahead of the September Futures and Options expiry subdued the Indian equity markets on Wednesday. According to market observers, high crude oil prices and caution over a likely default by some of the major players in the non-banking financial sector eroded investors' risk-taking appetite. A rate hike by the US Fed can potentially drive away foreign funds from emerging markets such as India. On the currency front, the Indian rupee closed on Wednesday at 72.61 per US dollar, weaker eight paise from its previous close of 72.69 per greenback.